Just a few blocks from Main Street is a little Eden. 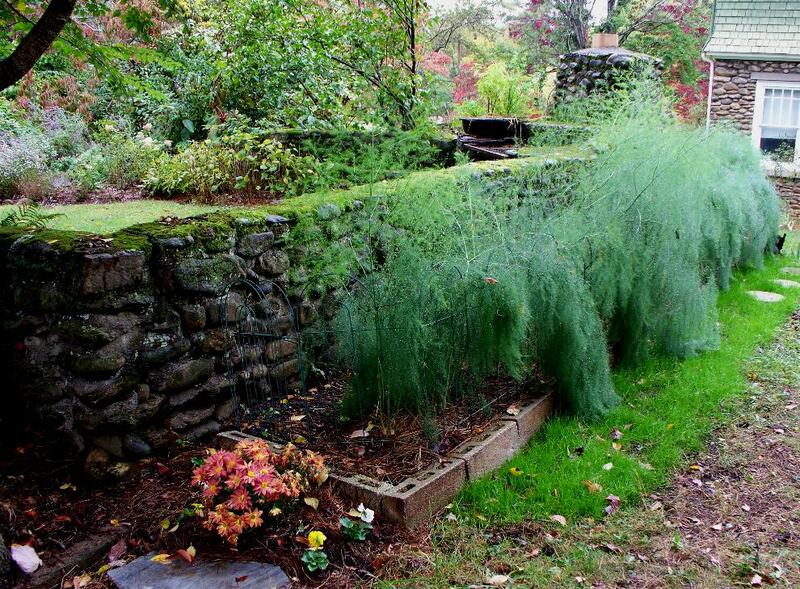 Mary Alice has compacted many thriving plants into her yard surrounding the house. 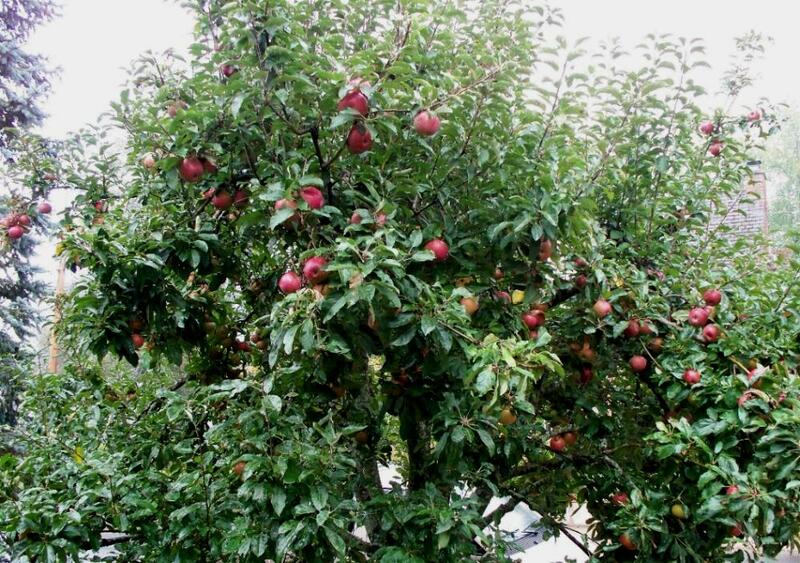 As you walk down the sidewalk in early fall, the first temptation is a loaded apple tree. She graciously shares these with many people. Her approach to gardening and life is environmental, evidenced in the front by the rain barrel and in back by a clothes line. 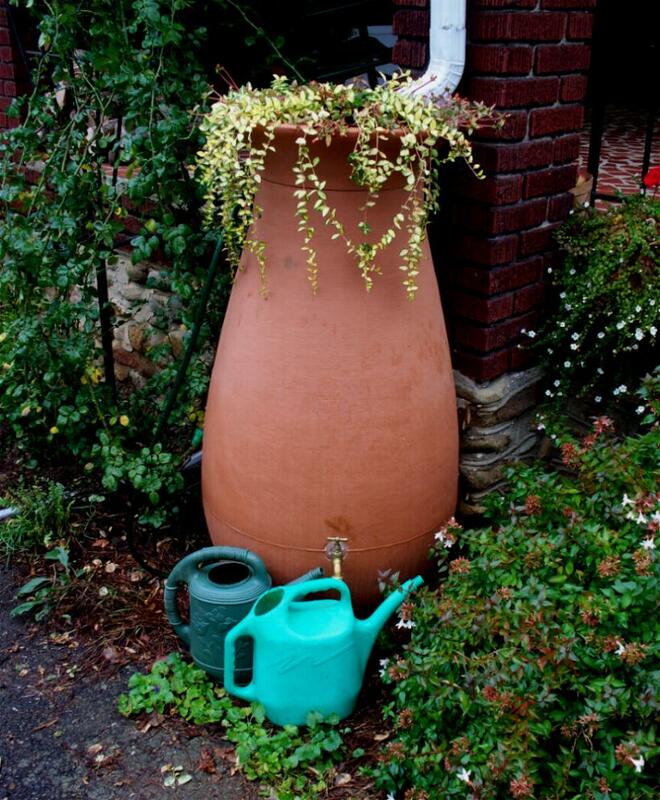 She wanted an attractive rain barrel so chose this one for the front corner of her porch. On one side of the house is the main gardening area. 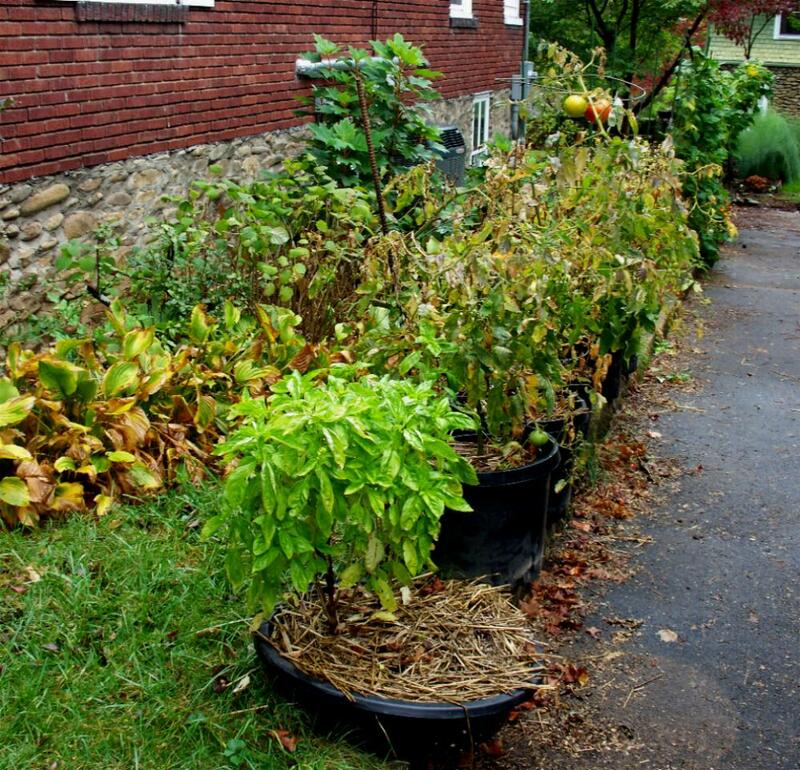 She takes advantage of every space, adding verticle pots full of vegetable and herb plants. These pictures show the ending bounty of a productive season. 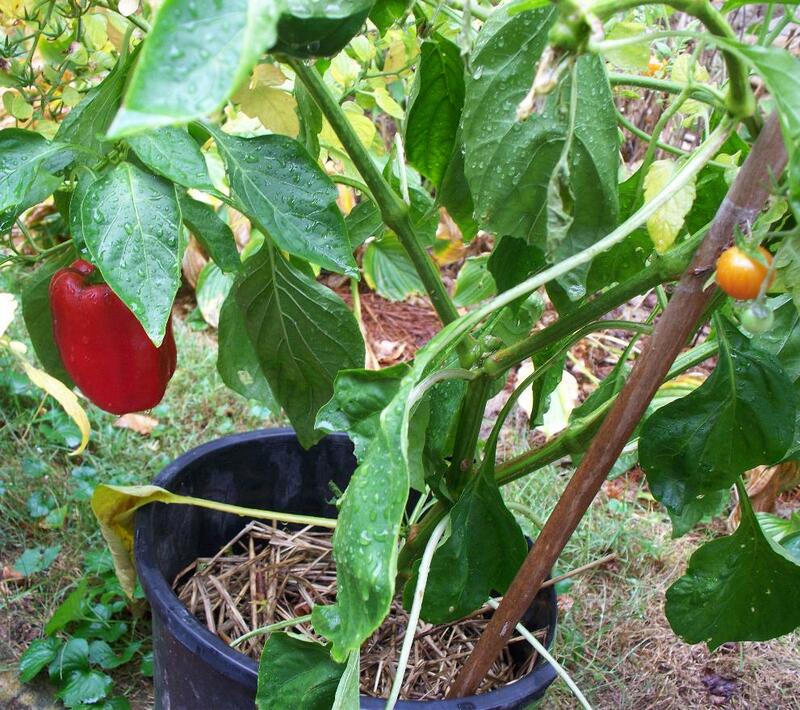 A ready-to-pick red pepper plant neighbors a ripening tomato. 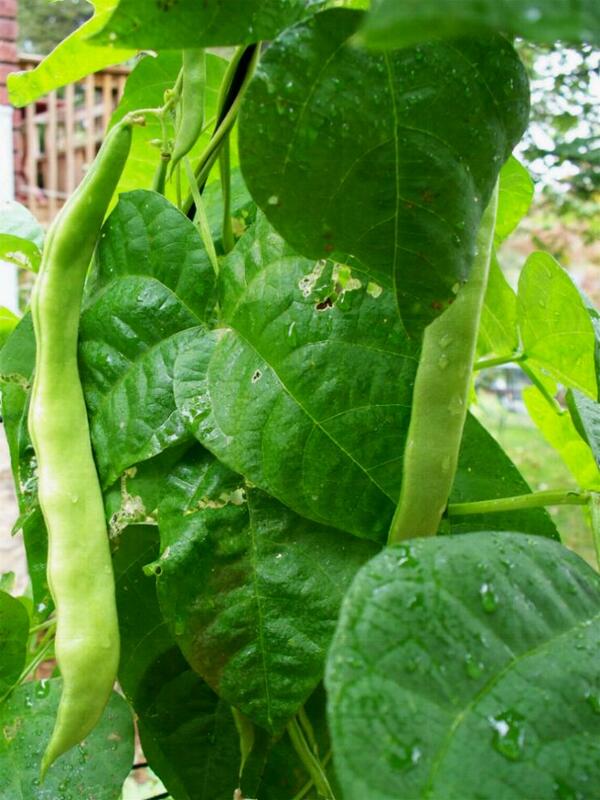 Mary Alice shared some of these Italian flat beans with me. After tasting their delicious flavor, I put them on my seed list for next year. They will be worth fighting the Mexican Bean Beetles that flock to my garden. 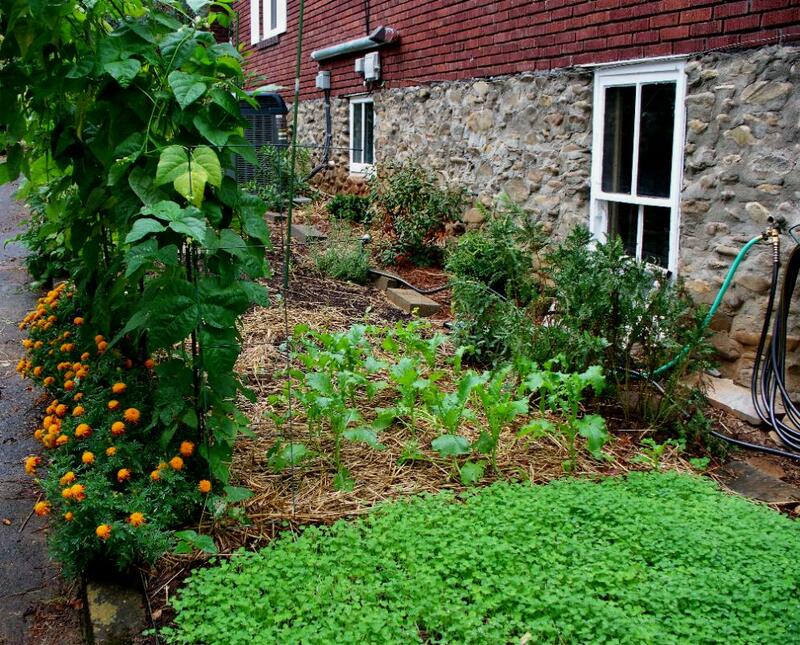 enjoy vegetables from a well-tended bed. Looking back from the asparagus patch there are many more plants that come into view. The closest is a crimson clover ground cover, a cover crop to be dug into the soil six weeks before spring planting. It fixes nitrogen and makes a lovely winter carpet of green. The straw keeps the weeds down in the second crop plantings of broccoli raab. 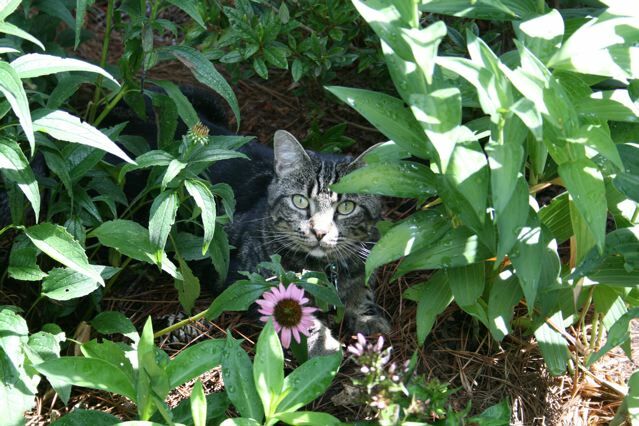 While visiting this garden you may find Gnocchi lurking, waiting for a small rodent to show itself so he can give chase. At times he loves to roll in the catnip, grown for his benefit. From the front porch the apple tree displays fruit ready to be picked and bitten. 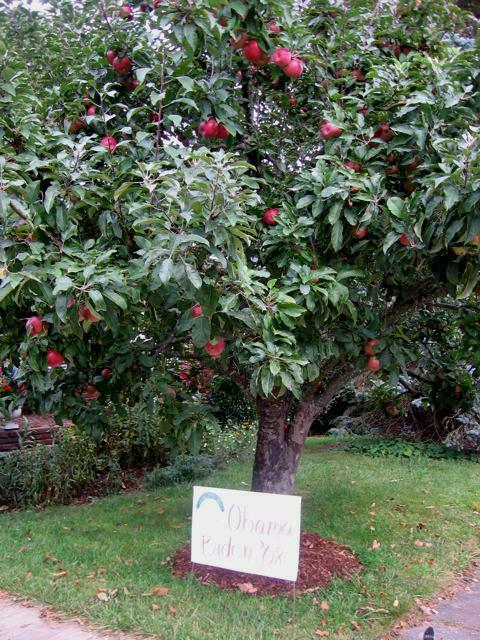 I appreciate Mary Alice supplying the first apple tree photo, and the one of Gnocchi. Hi Mary Alice. We love your garden. Your asparagus picture is the most dreamy on the internet. Can I borrow it for my blogsite? Hi Cecilia. Sure you can use the photo. This is my next door neighbor’s back yard. She is 90 and in a nursing home and suggested I plant an asparagus bed there. I’m sorry she’s not here to enjoy it. I love to sit at the bottom of the driveway and watch the ferns floating along the mossy stone wall. It IS beautiful. Oh Wow, her garden is just gorgeous. I would like to use the picture of your rain barrel on a sign at a public natural area in Illinois. The sign encourages people to use several practices at home to reduce non-point source pollution Would you be willing to do that? We will attribute it to you. Yes, you are welcomed to use the picture. i wish for enjoyment, since this this website conations truly good funny information too.